When we first designed the website for Annie Searle & Associates LLC, we architected our products and services at the same time. In other words, we determined just what work we would do and how we would do it. As part of that effort, after a long conversation with Kevin Desouza, I set up two sides to the business. The first is ASA Risk Consultants, where we do work for clients that ranges from executive coaching around business risk, to redesign or rework of existing security or business continuity plans. The other is the ASA Institute for Research and Innovation, where we determined early on that we would publish research notes or papers that focused on a wide range of operational risks. At no charge. And available to anyone who wanted to read them. From that initial vision came ASA News & Notes, our monthly newsletter that introduces new research notes, covers upcoming events of interest to risk professionals, and includes my own monthly column, usually a rumination on a current risk-related issue. It ships around the globe, to roughly 700 subscribers every month. I get notes back from readers every month, but none pleased me more than this one: "Say, Annie, I just thought I should say “Well done!” with your consistent newsletters and research notes. Many people intend to produce such things but few actually do, and so consistently. So: Well done!" Though we've gathered research notes into volumes once we hit a certain level of critical mass, you can still find the original pieces on our website at no cost. This commitment to the open expression of ideas has other manifestations as well. I teach regularly as an affiliate faculty member at the University of Washington. And I support literacy through my work at the Seattle Public Library Foundation board. I also do the kind of work that falls to the research and teaching side of the equation because it feeds my own desire to take it to the next level. When I was asked earlier this week if I was concerned about others copying my approach or my ideas, I had to laugh. Who said "imitation is the sincerest form of flattery?" Of course the academic in me wants to remind emulators to credit me when appropriate, especially if excerpting or patterning from my copyright work. Meanwhile, I'll just keep putting work out there. I have two large writing projects with upcoming deadlines. 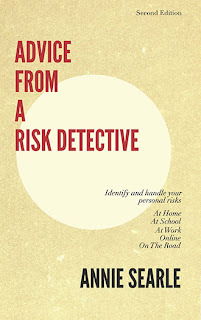 The first is a second edition of Advice From A Risk Detective. I think I've mentioned here before that it includes a new chapter to deal with personal risk at school, as well as a number of other additions and updates since first published in 2011. The other is a second volume of Reflections on Risk, for which I'm writing a forward and head notes on each of the 25 or so research notes, all written by ASA research associates or by students in my UW courses. As we begin our fifth year of operation later this month, I'll keep setting the bar higher for myself. That's how it's possible to take it to the next level. Our national preparedness -- why do we care? Two way question: Are you a good fit?